I mean to bring something nice over when you invite me to your house. Hopefully I will at least show up with a bottle of wine or a six pack of drinkable beer. But sometimes getting out the door with shoes and coats and all three children is all I can handle and on those occasions, sorry, I owe you. I’m lucky to have understanding friends (and reciprocity agreements in place). Last weekend, I got about halfway to my goal of bringing some kind of nice baked good to our weekend hosts. Which brings us back to the topic of traveling with oats. I didn’t manage to actually bake the batch of granola I meant to take to our friends in Portland, but I did get as far as packing two jars with the ingredients for this olive oil granola: one big jar of dry ingredients and another smaller jar of wet ingredients. It wasn’t quite like showing up with a perfect cellophane-wrapped treat with a ribbon on it (just kidding, I’ve never done that), but at least the house smelled good while it baked. We have eaten a lot of that olive oil granola in recent months. (Here’s a variation with pistachios, dried apricots, and cardamom.) J claims he could eat it for every meal, but it’s so sweet that his teeth might fall out. Here’s another option, a bit less decadent and perhaps therefore better suited to eat as an everyday breakfast. Or for three meals a day, your call. I am an orange zest junkie (have you made this bread yet? ), so this recipe appealed to me immediately. Orange zest, currants, walnuts. I was intrigued by the fact that the recipe (mine is adapted from Heidi Swanson’s Super Natural Every Day) calls for butter in place of oil, but I really didn’t taste any difference and will probably just make it with oil next time. Maybe even olive oil. Granola with Orange Zest, Currants, and Walnuts: In a large bowl, combine 4 ½ c. oats, 1 ½ c. walnuts, and ½ tsp. salt. Zest two oranges right into your bowl. Melt 1/3 c. butter and whisk it with ½ c. maple syrup, then pour the wet ingredients over the dry ingredients and mix well. Spread on two rimmed baking sheets and bake at 300 degrees, stirring occasionally and switching the pans the pans as necessary for even cooking. When the granola is golden brown, after about 45 minutes, remove from the oven and stir in 2/3 c. dried currants. Allow to cool. This entry was posted in Baking, Breakfast, Easily Multiplies to Feed a Crowd, Feeding Kids, Vegan or Would-Be-Just-As-Good-Vegan and tagged baking, breakfast, children, cooking, DIY, family, food, granola, healthy, homemade, kids, lifestyle, recipes, vegan, whole grain on April 19, 2012 by emmycooks. Yum! I have never made granola into cookies, but it doesn’t sound like a half bad idea. The olive oil granola is a great indulgence. I love the flavors but tone down the sugar for every day eating! Don’t think I was on board yet for the olive oil granola. Must backtrack. This looks lovely as well. And I think homemade granola is a SUPER gift. Inspired by you and Cook to Love —I’m making a version of my own this weekend–using olive oil. Thank you! 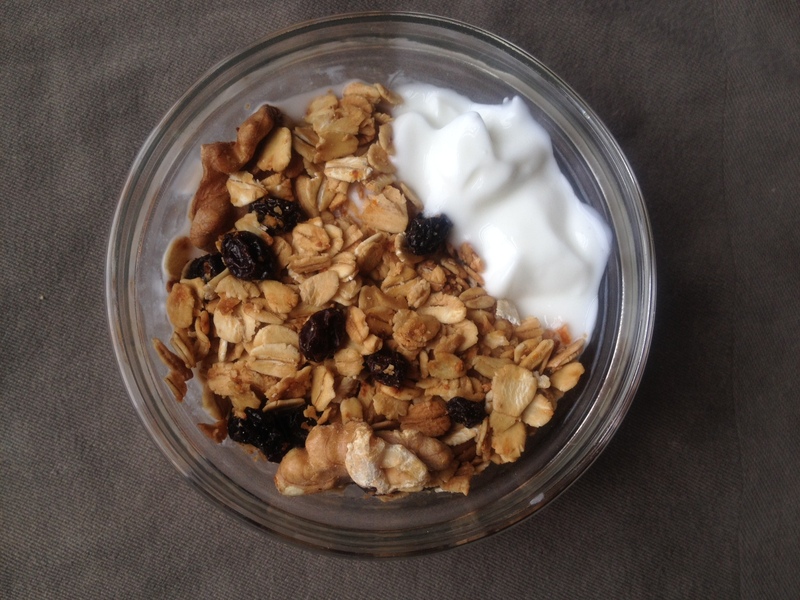 So glad to hear it–I find that my life is always improved by homemade granola. If you did try this recipe with olive oil, let me know how it was! Yep, anything with orange zest! I think I may be getting a little fanatical. I really don’t want my kids to eat the oranges from the fruit bowl until I have used the zest! I think that is the best gift ever! When I was in Paris doing my internship, the chef would always tell me how she thought it was weird that Americans always brought wine or beer for dinner. And then someone else said something similar to me: How are you, the guest, supposed to know which wine is going to go perfectly with the meal your host is cooking? It’s true that it’s the thought that counts, but after those experiences, I appreciate a gift like what you gave much, much more than a bottle or beer grabbed on the run. What internship did you do with a chef in Paris? And here I thought I knew you so well. :) That is so cool! It was just the most random thing. I was living in Paris for a year and crashed this cooking class for the undergrads. The chef used to be at the Hotel School in Lyon, and then decided to open her own cooking School in Paris. I think that I came along right when she lost another intern (visa issues), and did the prep for her for the rest of the year. Most of my internship was in the spring, so I did a lot of seafood prep. Fish guts everywhere! I’d love to try this with coconut oil instead of butter! Yum! I thought the same thing myself! The original recipe had large-flake dried coconut as well–I was thinking I might try a version with the coconut and coconut oil. Let me know how it works if you try it, I have never used coconut oil in granola! All these granolas look and sound so good! The only reason I’m hesitant to try them is that the Culinary Enthusiast can’t eat oats, and I just know I’d eat the whole batch myself in far too little time. As soon as I can muster up the restraint I’m going to try this! I got a great tip a while back, which is that granola freezes well! I never would have thought that, but I tried it out and it’s true! So you could really even make a batch and just grab a few handfuls for your bowl when you are in the mood. Yum yum yum! Orange zest makes everything better, and I’ve been looking for a good granola recipe (naturally, for my granola cookies). Thanks for another great post! I do not see granola cookies among the many fabulous-looking recipes on your website! Please add the link here when you post them, we are all saving some granola to use in the recipe when you do! !